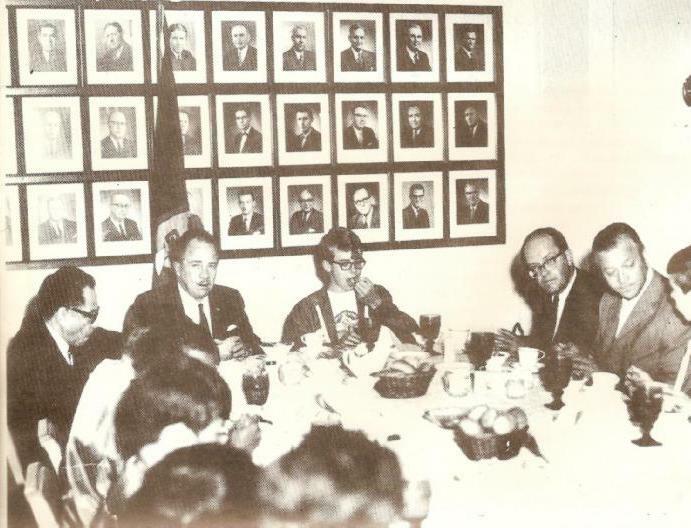 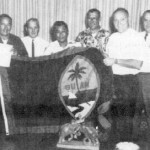 1969-70, Rotary International President James F. Conway Visits Guam. 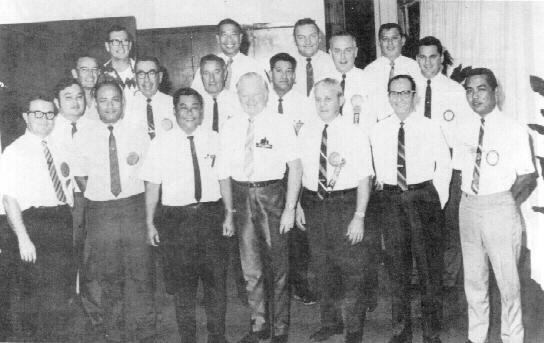 It gives me extreme pleasure to be asked to participate in the Celebration of “Fourty Years of Rotary in the Marianas”, as the Past President of the Rotary Club of Guam, 1969-1970. 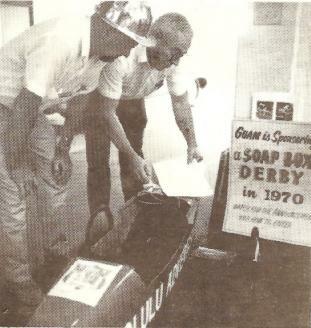 I wish that I could be there in person for the celebration. 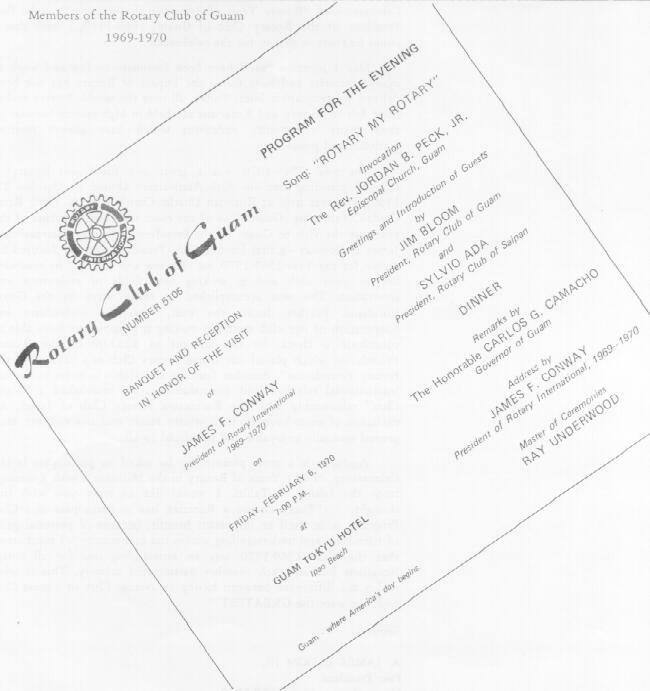 May I mentioned that I have been fortunate to live and work in many countries and have found the impact of Rotary has not been defined by geographic lines. 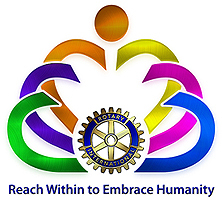 Today, all over the world, Rotary makes itself felt in society and Rotarians are held in high esteem because of their many community endeavors which have always merited gratitude and praise. 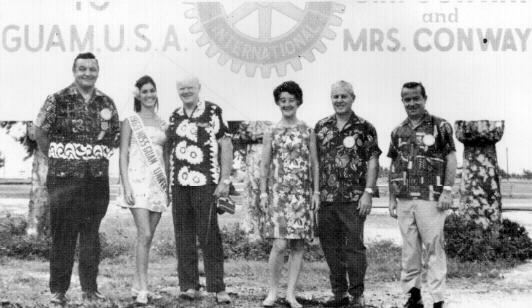 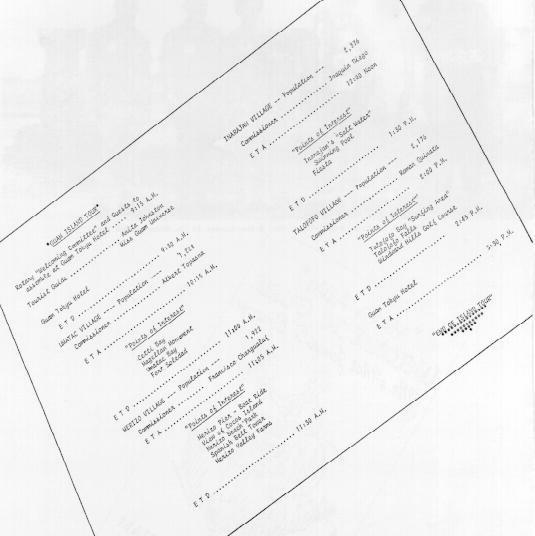 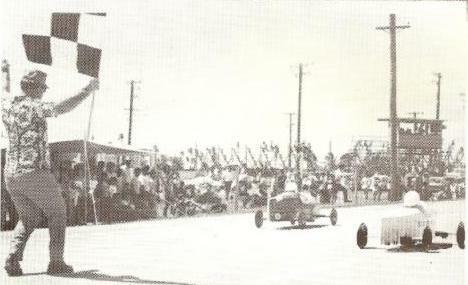 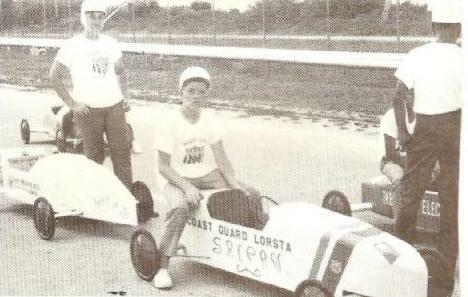 The year 1969-1970 was a great one for Guam Rotary! 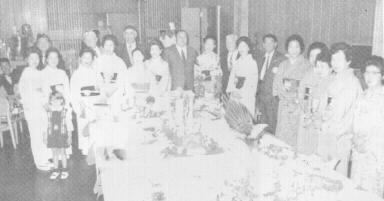 I enjoyed presiding over our 30th Anniversary Dinner on October 21, 1969, This was held at Rotarian Charlie Corn’s famous Hong Kong Garden, Tamuning, Guam. 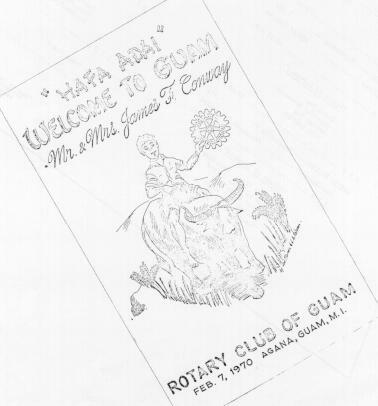 One of the most outstanding events of the year was the visit to Guam by the President of Rotary International, James F. Conway – a first for our club. 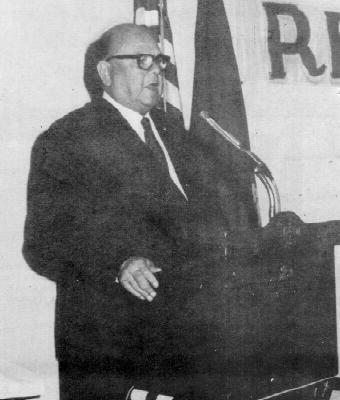 President Conway focused his theme for the Year 1969-1970, on “Review and Renew” by renewing life in your club and in seeking new fields of endeavor and innovation. 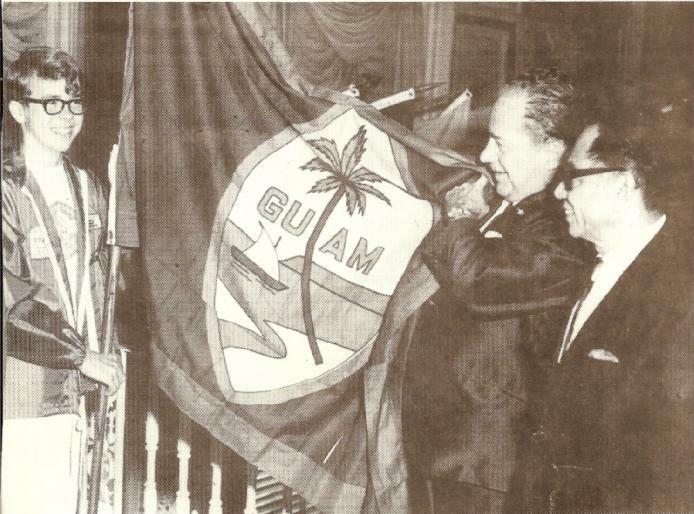 This was accomplished in many ways by the Guam Rotarians. 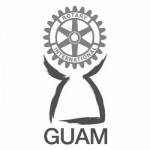 Further during the year, with the enthusiasm and cooperation of our club members making it possible, we were able to contribute a check for the amount of $283.00 to the Rotary Foundation which placed our Guam Rotary Club as a “Friend of the Rotary Foundation”. 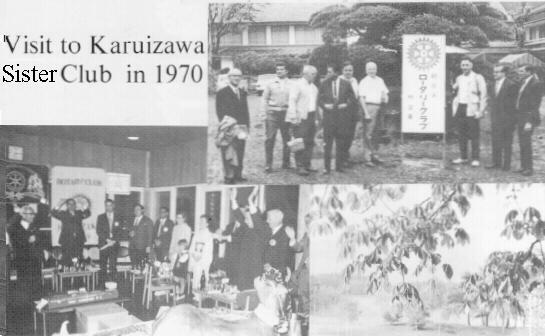 Another first for our club – in order to further International relations and understanding, we established a “Sister Club” relationship with the Karuizawa Rotary Club of Japan. 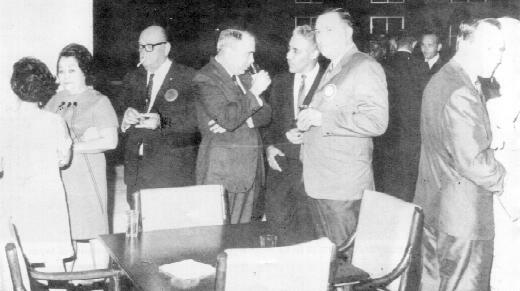 An exchange of visits between their winter resort and our summer area, proved mutually enjoyable and beneficial to all.